Hard to Find: One with a good screen is hard to find. It took me two tries to do so. 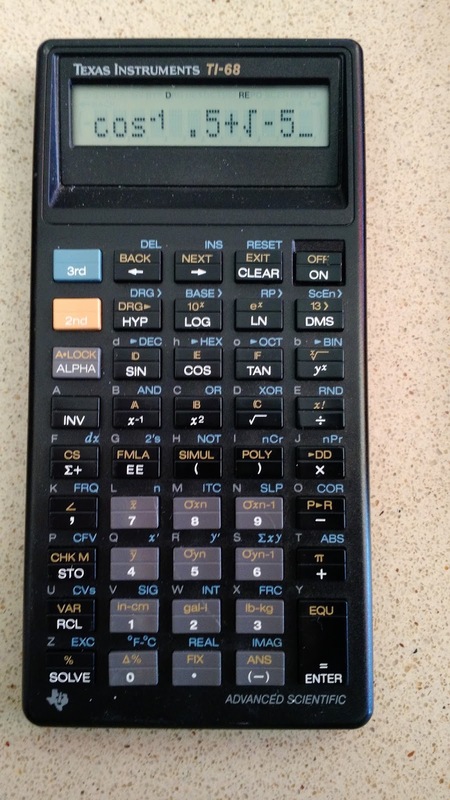 What I love about the TI-68 is how complex numbers are integrated in the operating system. There is no need to switch to a separate mode. Best of all, the TI-68 handles exponential, logarithmic, power, and trigonometric functions with complex numbers. Part extraction of complex numbers works slightly different: real and imag extract the real and imaginary portions of the complex number, regardless of setting. 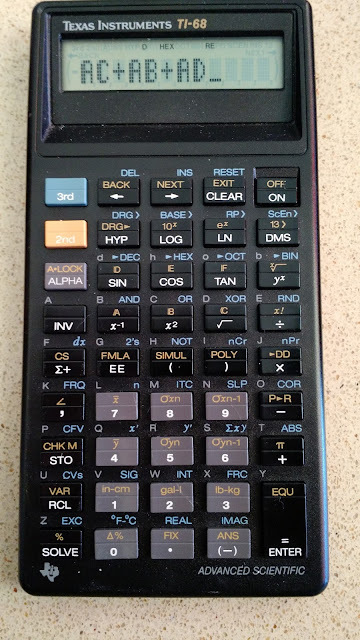 The TI-68 allows for two precision settings: 10 digits or 13 digits. The display uses 10 digits. I think this is a rarity, if not a completely unique feature, since calculators in general uses an accuracy of 13 to 15 digits automatically. I tested a couple of integrals and the precision setting does not affect the length of time either way. Both integrals were calculated in about 3 seconds. The TI-68 uses the Simpson’s Rule during integration. To integrate, during evaluation, designate the variable to be integrated by pressing [CLEAR], [ 3rd ], [ Σ+ ] (dx). The TI-68 has formula programming. There are no loops or comparison tests, but all variables are local, meaning their stored values can be transferred between formulas. Something I learned about the TI-68: you can have variables up to 3 characters. Each formula can be evaluated (right hand side of the equation) by pressing [SOLVE]. Each variable can accept a real or complex number. Let’s talk about the keyboard. The keys are nice and responsive. But get a look of all those shift keys! There are two shift keys, [ 2nd ], [ 3rd ], along with an inverse key [ INV ]. This is reminiscent of the 1974 Hewlett Packard HP 65 calculator, where its shift keys were [ f ], [ f^-1 ], and [ g ]. ‘* D = Degrees, R = Radians, G = Grads. Angle mode is unaffected. To change angle mode, press [ 3rd ] (DRG) (it cycles Degrees, Radians, Grads). 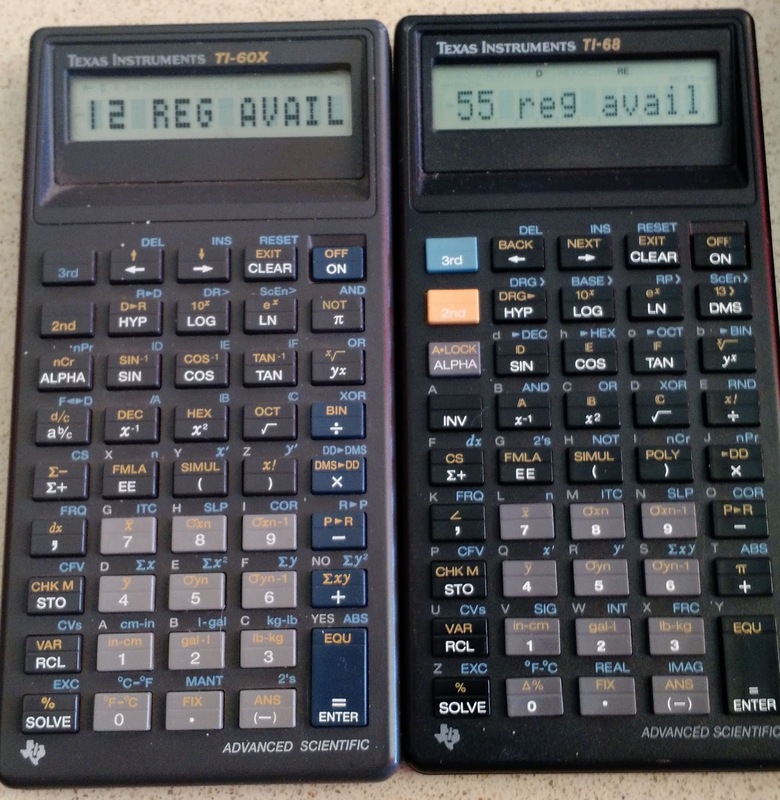 TI-60X (left), TI-68 (right). Their memory capacities are shown. In 1991, Texas Instruments released a more basic version of the TI-68, the TI-60X. For more details, check out this link: http://edspi31415.blogspot.com/2017/01/retro-review-ti-60x.html. I regret not getting the TI-68 when it first came out (which would have consisted in asking my family for one). It’s finally nice to have one and it’s worth the hype and praise it got. I do have a question about the TI-68 though, does it handle fractions? I have a 68 and a 60X and actually have the manual for both, but either I missed it or the 68 does not handle fractions.